For other places with the same name, see Verona (disambiguation). Though close to the more popular tourist destination of Venice, many people consider Verona a more relaxed and pleasant place to visit. There are many tourists, but the number of tourists per square metre is lower. 45.40260810.9066341 Aeroporto Valerio Catullo (VRN IATA) (12 km from the city). Also known as Verona Villafranca Airport. Mostly budget flights, including from Brussels (both National & Charleroi), Dublin, London (Gatwick & Stansted), Paris Beauvais, and Madrid, and domestic routes from Alghero, Palermo, Trapani, Brindisi and Rome. Free WiFI is available with registration, SID: @FreeLuna_CATULLO. If you have a rental car the trip to Verona isn't difficult: take the A4 towards Padova (Padua) and follow all the way to Verona (approx 7 km). Venice Marco Polo (VCE IATA) is further but has far more flights. From there take the shuttle bus to Mestre railway station (25 min), then the train to Verona (1 hour) – see Venice: Get in by air page for shuttle bus details. Also within a couple of hours of Verona are Venice Treviso and Bergamo airports. These have no obvious advantage. Some local trains (regionali) also stop at another station in Verona, 45.43577411.0186973 Stazione di Verona Porta Vescovo. City bus schedules are difficult to obtain on-line and also not available on maps.google.com. The 11, 12 or 13 bus on weekdays will get you from the train station (Stazione Porta Nuova) to the Arena (Piazza Bra). Sunday and holiday schedules differ with a separate numbering system. You can obtain bus schedules sending SMS to a number printed on bus stop. Some of them have an indication of the time left for next bus to arrive. You can pay the fare using euro directly on the bus, but only for one ticket, while you can easily buy tickets at a lower fare nearly everywhere there is a cigarette or lotto shop. ATV shops are in the railway station and in Piazza Renato Simoni, near the railway station. Verona was a Roman city, and many Roman ruins have been preserved, notably the Arena. The ancient city was badly wrecked by the earthquake of 1117 AD, which led to a flurry of re-building. Therefore, most of the historical sights on view today date from the past 800 years, while the Roman city lies 6 metres below you. Verona showcases the transition of Western European art from late medieval to early renaissance styles, with its rich offering of 12th-century churches and art museums. Verona's military importance has also left city fortifications and an excellent castle. Look out for architectural details related to the Scaligeri (or della Scala) family, who ruled the city from the 12th to 14th century – e.g. their family emblem is a ladder, scala in Italian. Top sights are the Arena, Castelvecchio, the churches of St Zeno and of Sant'Anastasia, and the cathedral. Much of the pleasure of Verona comes from simply strolling the medieval centre, especially in the evening when the day-trippers have departed. The Arena hosts performances by the world's top singers, and when these are on the whole city, not just the Arena, will be booked solid. 45.43888910.9944441 Arena. Open daily, but closes early if there's a performance that evening. An enormous, spectacular Roman amphitheatre, crumbling on the outside but still in use today. It was erected in the 1st century AD in an elliptical shape, and is the world's third-largest amphitheatre to survive from antiquity. The outer wall fell down during the earthquake of 1117, except for a small section locally called the "Ala" or wing, and enterprising citizens used the rubble to build houses on the back of the structure. What you see today is the masonry supporting the tiered interior. Catch an opera here if you possibly can, but you'll need to book months ahead. Note there's another smaller amphitheatre across the river, see below. €6.00 regular, €4.50 for students. 45.439410.987522 Castelvecchio (Museo Civico di Castelvecchio). A 14th-century, red brick, fortified castle on the banks of the river Adige. The main castle buildings house the city art museum which is packed with a rich collection of medieval sculpture and Renaissance paintings. As well as the museum, the extensive castle ramparts are great for exploring - ideal for families with children who enjoy running around castle fortifications. The Castelvecchio has an adjoining bridge over the river which is open all the time - walk over the bridge for some fantastic views of the castle on the river. Castelvecchio hosts the Circolo Ufficiali, which is reserved to people who joined the army as officers. Sometimes hosts musical events or art exhibitions. 45.44305610.9972223 Piazza delle Erbe. Home of the Forum in Roman times, this is still a focal point of the city. Contains the 'Britney Verona' fountain, 14th-century 'Gardello Tower', and a market that, while picturesque, seems to have become another tourist cliche during its refurbishment. 45.4429510.997754 Lamberti Tower (Torre Lambert). 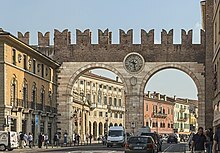 M-F 10:00-18:00, Sa Su holidays 11:00-19:00. completed in 1463, this is the tallest of Verona's towers. 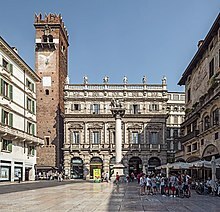 The distinctive clock tower looms over the Piazza delle Erbe, and you enter via the palace courtyard. 238 steps to the top, or take the lift, for great views. Ticket also includes admission to the Modern Art Gallery - but this is closed Mon and price is reduced. €5 adult. 45.4419310.993585 Porta Borsari. The remains of a Roman gate, dates to at least the 2nd century AD, but is almost certainly older. 45.4472510.997086 Verona Cathedral (Duomo). was built to replace an 8th-century church which was destroyed in the earthquake of 1117. Consecrated in 1187, the church features an ornate marble Romanesque façade by the Veronese architect Nicolò; its pillars are supported by two griffins. Stone reliefs around the door include Biblical scenes. The smaller side door is also worth a look - medieval carvings include Jonah being swallowed by a whale. Inside, the nave has many Gothic alterations, and oil paintings around the side chapels include an Assumption by Titian. The Romanesque baptistery adjoining the chapel of Sant'Elena is preserved, with its exquisite marble font and collection of medieval paintings. 45.442510.9791677 Basilica of St Zeno (San Zeno Maggiore). A 10-minute walk NE of Castellvecchio. The church is dedicated to Verona's patron saint, Zeno, a 4th-century North African and a keen fisherman who was ordained Bishop of Verona in 363. Zeno's tomb lies in a shrine in the church undercroft, and he is also commemorated in a grinning medieval statue in full episcopal robes, dangling a golden fish on the end of a fishing rod. The entrance to the church is graced with an ornate Romanesque façade by Nicolò; like the cathedral, this church was erected after the earthquake of 1117. The church itself was a centre of European pilgrimage for centuries; pilgrims were greeted by huge 10-metre frescoes of St Peter, patron saint of pilgrims. Visitors across the centuries have left their mark - pilgrims happily inscribed graffiti in the frescoes, and signatures dating from 1390 survive to this day. There is also graffiti left by the invading Austrians in 1865. 45.44526610.9999548 Chiesa di Sant'Anastasia. Richly decorated in 13th-15th century Gothic style. Note especially the Pelligrini Chapel, with the Pisanello depiction of St George setting off to fight the dragon. 45.44513810.9992569 Chiesa di San Giorgietto (San Pietro Martire). A tiny chapel immediately next to Sant'Anastasia. Easily overlooked, this church is richly decorated with early Renaissance frescoes depicting the walled garden of the Virgin Mary. 45.44126910.9912110 Chiesa di San Lorenzo. 45.43919910.99997511 Chiesa di San Fermo Maggiore. 45.442021210.998557612 Casa di Giulietta (Juliet's House), via Cappello 23 (just off the Piazza delle Erbe. ), ☎ +39 045 8034303. M 13:30-19:30, Tu-Su 08:30-19:30. Presented as the location of the famous balcony love scene from Shakespeare's Romeo and Juliet, the house is a major destination for tourist pilgrimage, as the tiny courtyard is normally packed with love-struck teenagers photographing each other on the famous balcony. In fact, the house has no connection with Shakespeare's fictional characters - although the house is old, the balcony was added in 1936 and declared to be "Juliet's house" to attract tourists. You can visit the house itself - it contains a sparse collection of Renaissance frescos rescued from other demolished palaces, and the bed from Zeffirelli's 1968 movie, but not a lot more. The balcony overlooks a tiny courtyard containing a statue of Juliet. There is an unbelievable amount of graffiti and general scrawling on the walls, floor, seats, anything that will hold ink - there is a tradition of writing love messages to Juliet, and visitors leave notes, trinkets and bits of chewing gum fashioned into love hearts. 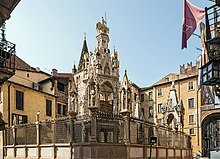 Juliet's house is a popular romantic shrine, but its popularity belies its value; compared to some of the treasures around Verona, Juliet's house has very little to offer. €6. 45.44370410.99935313 Casa di Romeo, Via Arche Scaligere, 4. So, if Juliet lived there, what about Romeo? A couple of streets away another house has been designated as his home. It is private, so other than a sign on the wall there is nothing much to see. 45.4336410.9975814 Juliet's Tomb (at the Capuccin Church, which also houses the Antonian Fresco Museum). A little further out across the river, find the Castel San Pietro, the Giusti gardens, and the other amphitheatre. The walk along the riverside is usually enjoyable, but in 2016/17, the pavement between the Roman Bridge and the Garibaldi Bridge is under reconstruction, with no end in sight. 45.4479811.002715 Castel San Pietro (St Peter's Castle) (across the Ponte Pietra (Peter Bridge). Climb the steps up the hill above the Roman Amphitheatre to the Castell San Pietro). This former Austrian barracks dates back to the Austrian occupation of the left bank, and while the building is not open to the public, the views from the hill over Verona are spectacular. Nice sunset views. 45.443032411.006396616 Giardino Giusti. One of Italy's most important renaissance/mannerist gardens, with grottoes, fire-breathing masks carved into the hillside etc. 45.4474311.0014217 Roman amphitheatre (Teatro Romano) (across the river on the hill, in the north-east of the city.). €1. 45.57510.81861118 Fort Wohlgemuth & World War I Museum, Via Traversa Castello, 6; Rivoli Veronese (34 km west and north of Verona), ☎ +39 045 7281166, e-mail: info@museowalterrama.it. The fort was built between 1850 and 1851 on the Mount Castle (227 m), north-west of Rivoli. The fort hosts a museum on World War I and on vintage radios. Adult €5, children under 12 free. Lamberti tower. Climb to the top of it or take the lift. Great views over Verona. 45.44125410.9959841 Via Mazzini. Verona's golden mile of shopping, taking you between Piazza Bra and Piazza delle Erbe. Most of the major Italian labels are represented, and even if you can't afford them it is great to wander and window shop. 45.4426810.994742 Corso Porta Borsari. is another elegant shopping street in Verona, eg Lo Scrittoio, an old-fashioned shop selling papery and elegant pens and pencils. 45.4438110.997593 Corso Santa Anastasia. This street is the centre of the antiques shops' zone. Narrow streets where you can find authentic masterpieces. 45.4381810.989164 Eurospar, Via Daniele Manin (From Castlevecchio walk into Via Roma, then turn right). A large two-storey supermarket with normal prices where you can find everything for your picnic. 45.4385810.993561 Piazza Bra bars. Eat gelato there. Pizza is not traditionally eaten locally, but pasta dishes feature widely on restaurant menus. Try Pizzocheri (buckwheat pasta with cheese and sage), casoncelli (a type of ravioli) or bigoli (thick spaghetti). 45.44610.998032 Al' Duomo, Via Duomo 7, ☎ +39 045 800 4505. Excellent family-run restaurant, just next to the Cathedral (as its name suggests). It's popular with the local Veronese (a good sign) and with a menu full of traditional local specialities. You'll find this is a good place to blend in with the local scene, and has welcoming staff who will help you with unfamiliar items on the menu. On Wednesdays, Al' Duomo plays host to a local mandolin ensemble, so if you're on a traditional music tour, put this on your list. As it's a popular place, booking is advised. Menus are not overpriced, about €15-20 a head (plus wine). 45.4443510.999873 Osteria Al Carroarmato (Armoured Car (Leonardo's, not Mussolini's)), Vicolo Gatto 2A, ☎ +39 045 803 0175. A charmingly atmospheric and good value restaurant/wine bar in the 'ancient canteen' style with shared tables and paper place mats. Food is authentically Veronan but unpretentious. There is an enormous, equally good value wine list, which can however rise to meet all budgets. 45.437978110.99123634 Signorvino, Corso Porto Nuova 2 (Just one block south of Piazze Bra. ), ☎ +39 045 800 9031. Restaurant and wine shop. Good food and great wines at very reasonable prices (wine at the table cost the same as in the shop). You eat either inside between wine racks or outside at one of 5 small tables. The menu consists of dishes from different regions of Italy. €12 mains. You pay the same price for wine in the restaurant as in the store.. Rain, Via Stella 13A. A wine bar and jazz club in the heart of Verona owned by brothers Giuseppe and Riccardo Zambelli Rain. Giuseppe is fluent in English. Ask for him if you have any questions about the area. Verona is frequented annually by millions of tourists, so you'll be able to choose among a lot of different accommodation options, all a lot cheaper than nearby Venice. However it is essential to have booked hotel accommodation on days when the annual arena opera performances are taking place. Turn up on spec or late and it is possible to find every bed in the city taken. There are three youth hostels in Verona, all within walking distance of the town centre and a short bus ride from the main train station (Porta Nuova). A tourist map, available from the station's tourist information centre, will point you to their locations. The northeasternmost hostel of the trio, near Piazza Isolo (regular buses from Porta Nuova) has a stunning converted Renaissance complex complete with porticoes, verandas and a huge forested garden, dorm beds for only €15 per person, with a passable breakfast included. Also consider several small bed and breakfasts in the immediate province, after all a car rental for €30/day and a substantial saving on the nightly fee is an acceptable turnaround. Especially if you need the car to visit the surroundings. Agriturismo Sommavalle, Via Sommavalle 9/a, ☎ +39 346 140 4242, fax: +39 045-835-0502, e-mail: info@sommavalle.it. In the Torricelle suburb north of Verona, 4 km from the historical centre; it occupies a sunny and panoramic area on the southern side of a hill about 300m above sea level. It can be easily reached by car or with the urban bus service. Reaching the train station (Verona Porta Nuova) will take about 20 minutes by car. rooms around €70. 45.4463810.999131 Apple Suite B&B, Via Santa Felicita 9, ☎ +39 3403499558, e-mail: applesuite@gmail.com. Full apartment, gentle host, in the heart of city centre. Rates from €80 depending on length of the stay. Ca Vendramin apartment, Via Dietro Filippini 2. In the quiet Filippini area, next the Arena (at five minutes walking). Rates from €40 per person. B&B Mambrotta (Agriturismo Verona Mambrotta), via Case Nove 3, ☎ +39 329-2322572, fax: +39 045-8820029, e-mail: info@bbmambrotta.com. 14 km from the center of Verona, and 2 minutes from autostrada A4 Verona Est exit, in a quiet and wonderful environment of Venetian plain, in Mambrotta village. It's 20 minutes by car to Opera of Arena of Verona and to Soave town, it's 18 minutes by car to Verona fair show and exhibitions. 45.433543210.98949552 Grand Hotel Verona, Corso Porta Nuova 105, ☎ +39 045 595600, fax: +39 045 596385. An elegant aristocratic building decorated with paintings and sculptures of some of best Italian artist of the 20th century, for this luxury four-star hotel of Verona. From the Grand Hotel one can easily reach by walk the famous Arena and the other monuments of the historic centre of Verona. 45.43025211.0582623 Hotel Gardenia, Via Unità d’Italia 350, San Michele Extra, ☎ +39 45 972122, fax: +39 45 8920157, e-mail: info@hotelristorantegardenia.it. High quality service with rooms from around €80. Hotel Italia Verona, Via Gofreddo Mameli, 58, ☎ +39 045 918088, fax: +39 045 8348028. Thanks to its large meeting room, restaurant and comfortable position close to the Central Train Station and the city centre of Verona, this excellent and economic three star hotel is one of the best accommodations for both business travellers and holiday makers coming to Verona, the romantic city of Romeo and Juliet. 45.39147411.11994294 Agriturismo Ca' del Ferro (15 Km from the heart of Verona). Rooms are very cosy and spacious and the owner is very helpful and friendly. You need to have a car though to reach it and move around. Single rooms at €45-€50 and double rooms from €75. They all have private beautiful coloured bathrooms. 45.4806811.056065 Agriturismo Delo Relais, Via del Torresin, Novaglie, 37141 Verona, ☎ +39 045 4858380, fax: +39 045 8301715, e-mail: mail:info@agriturismodelo.it. A charming farmhouse a few kilometers away from Verona city center in the Veneto hills. The property features 4 standard rooms, 2 junior suites and 2 suite. €130-200. The surrounding area around Verona offers access to some of Italy's most spectacular scenery - to the north you have rolling hills with vineyards and small towns, to the west the Lake Garda (Lago di Garda). Drive to the nearby valley Valpolicella, famous for its renowned Amarone, Recioto and valpolicella wines as well as for its ancient villas. Lake Garda can be easily reached from Verona for a day trip. Buses run by APTV (the regional bus company) leave from Porta Nuova - catch a 62-64 bus in the morning from the railway station or from Corso Porta Nuova (the boulevard just south of Piazza Bra). It takes about 2-3 hours, depending on lakeside traffic (which can be heavy), to reach pretty towns of Malcesine or Torbole. Get a timetable (orari) from the tourist office or from APTV transport website (Lake Garda is in Zone C). Tickets can be bought from the tobacco shop down the road or on the bus. Lake Garda has its own theme park, Gardaland, with accommodation. Other centres easily done as a day-trip by rail from Verona include Vicenza, Padova, Mantova and of course the big draw Venice. This city travel guide to Verona is a usable article. It has information on how to get there and on restaurants and hotels. An adventurous person could use this article, but please feel free to improve it by editing the page.